It's now officially February and time to start planning for Valentine's day. Whether you're going out or staying in it's always fun to celebrate LOVE. For those of you that are planning either a date night out or a fun girls night on the town I've got you covered! 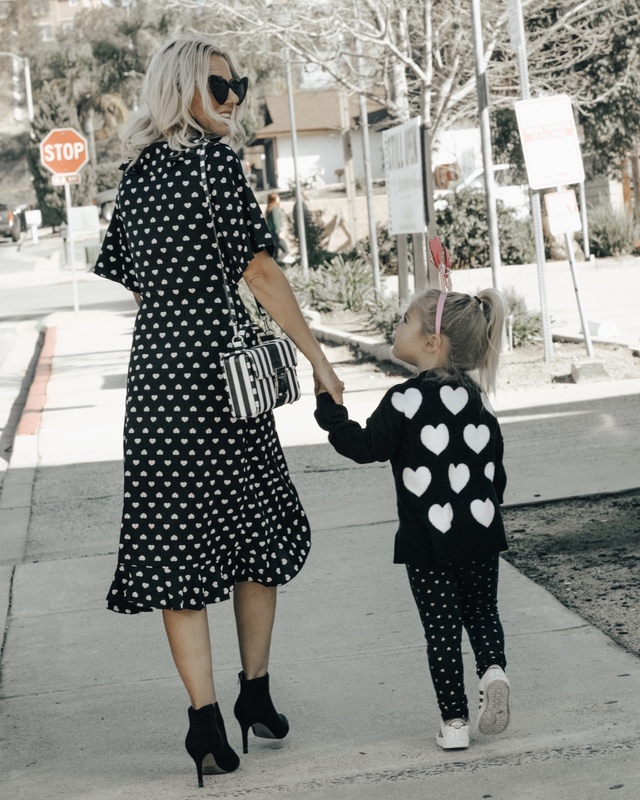 As your probably already know I LOVE Valentine's day and I think it's so fun to get festive and wear a cute heart print. When I saw this adorable Asos dress I just had to order it. The cross over front is very flattering and I love the added ruffles. It's a nice midi length so you could really wear it anywhere. I added my go to black booties and striped handbag to complete the look. Since it is pretty cold you could definitely throw a black moto jacket on top or even a faux fur jacket. This outfit is a little more of a flirty date night look. The babydoll style dress is very flattering and I love the girly ruffles. It also comes in 2 other colors and is on major sale! I added the faux fur jacket because let's be honest it's still pretty cold out there! Add with a cute black handbag, some delicate necklaces and these darling stilettos you're good to go. Well that's all I have for you. Hope you have a fun Valentine's day and whatever you're doing I hope you spend it with the ones you love!